Nilfisk's new ALTO AERO series takes cleaning performance and productivity to a new level. The Nilfisk AERO 26-21 6.6-Gallon Shop Vacuum (900142/107419097) features a compact design made specifically for tough wet and dry jobsite clean-up. Make quick work of even the most difficult sanding projects with its 25-liter container capacity, 127 maximum CFM, and 84-inch maximum waterlift. Nilfisk's Push & Clean feature also includes a semi-automatic filter cleaning system for quick and easy maintenance. For the highest level of filtration, consider the Aero 26 HEPA Wet/Dry Vacuum model, which includes a HEPA filter to remove 99.97% of dust and debris down to .3 microns. The Nilfisk ALTO AERO series is built with German-engineered technology to ensure the highest-quality clean and reliability. Nilfisk engineers used their deep customer understanding and technical expertise to make wet/dry clean-up low maintenance. The easy-to-remove container makes disposing of waste a quick task, while its flat design was manufactured for tool storage during operation. In addition, the AERO series vacuums are fully sealed so there's no blow-through dust—making them ideal for lead paint, asbestos, and remediation work. Its quality construction also makes it a top choice for professionals in the automotive, building and construction, and multiple other industries. What separates the AERO 26 model from others in the series is the multiple convenience upgrades. Its Electric Autostart feature allows you to plug small electric tools into the vacuum. Sanding and grinding tools are often plugged in for quick work and less mess. An accessory net, flat-top design, and rubber strap for the hose make storing and using numerous other tools a low-maintenance task. A lightweight canister design makes the Nilfisk ALTO AERO 26 a great option for cleaning wide open job sites as well as tight, difficult-to-reach spaces. It also allows for easy transport around your home or to various jobsites. 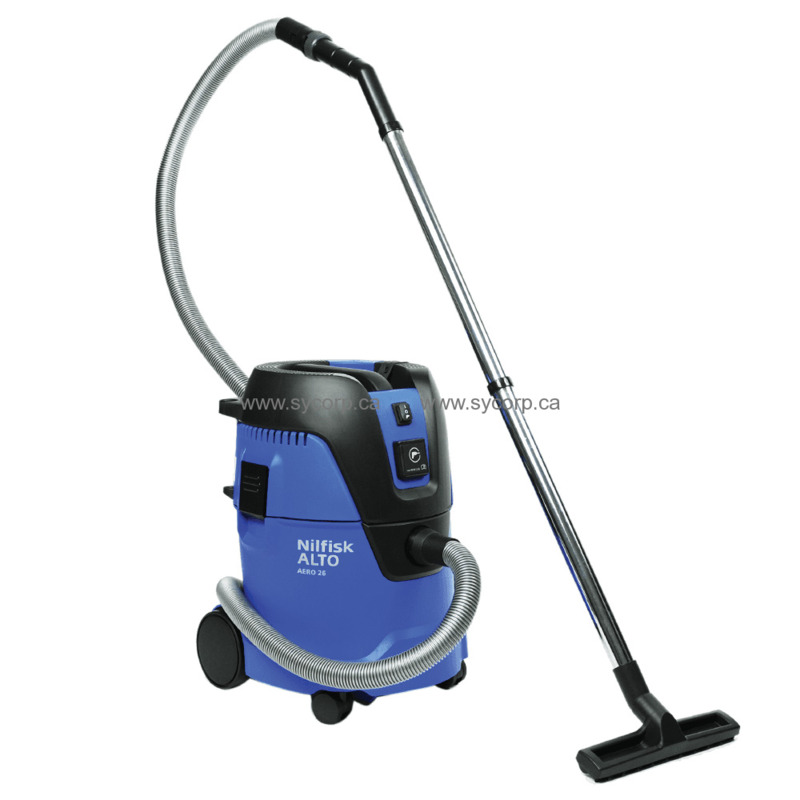 The Nilfisk ALTO AERO 26 comes HEPA filter. This filtration catches 99.97% of all particles down to .3 microns. The available upgrade makes this model compliant with EPA RRP, OSHA, NIOSH, and DoD standards.